All the rage in the US is cut-down tourer versions of traditional cruiser machines. Yamaha now come to the table with this great new variant available in kit form, created just for you by your Yamaha dealer. Styled for custom cruising, the new 2013 Yamaha XV1900A Midnight Star CFD (Casual Full Dress) brings both elegance and luxurious comfort to the cruiser market while retaining the reputation for power and performance that is associated with this V-twin family. The XV1900A CFD enhances the overall riding experience thanks to a host of new features. 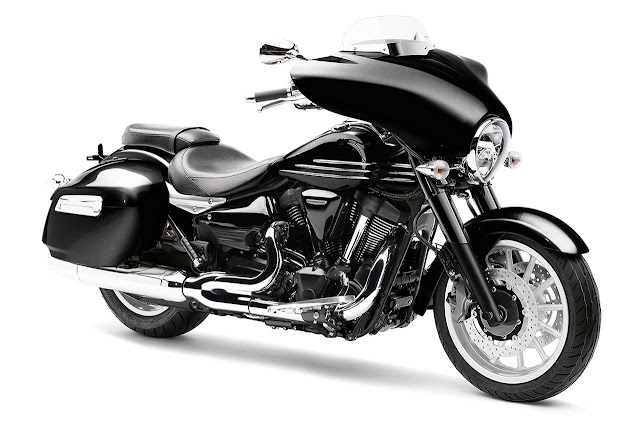 A new full-width fairing combines timeless style with effective wind protection while two spacious colour-matched hard cases with quick-release fixings and one-touch openers make the XV1900A CFD an even more attractive tourer. Those who are looking to unlock the touring potential of this impressive machine will appreciate the windscreen as well as the long and low aluminium frame that is designed to deliver a sporty yet balanced ride. To further enhance the usability of the powerful 1900cc air-cooled V-twin engine, the new model now features an 'assist and slipper' clutch. This new design of clutch reduces the effort required to operate while also enhancing the motorcycle's stability under deceleration. Star CFD is built for serious cruiser riders who want a stylish neo-streamliner that has the potential to handle long distances.